The word Yoga arises from the Sanskrit root Yuj which means to get hold of, integrate and harmonise. It means getting hold of our lives, integrating all aspects of life and harmonising our bodies with our minds, spirits and society. 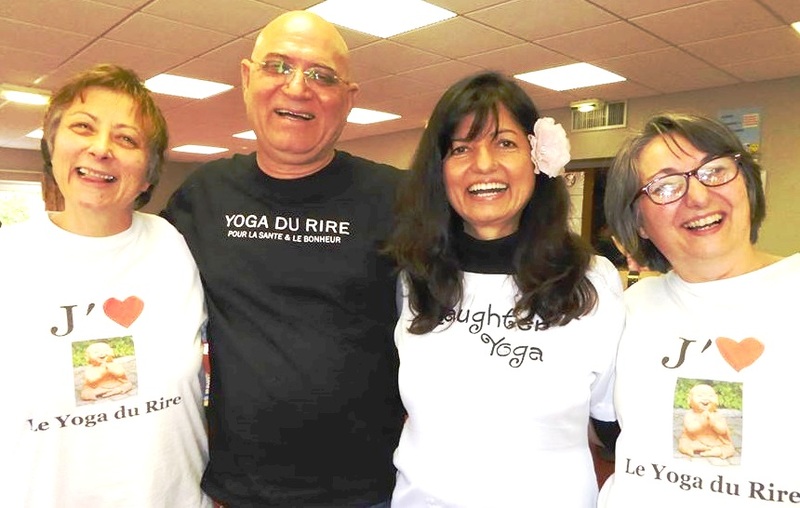 As the concept of Laughter Yoga evolved, Dr Kataria found a deep connection between the basic fundamentals of yoga and what one did in laughter clubs. He incorporated deep breathing exercises from yoga in between laughter exercises, which helps to increase the net supply of oxygen to the body and brain. Breathing is fundamental to life. One can live without food and water for several days, but cannot survive if breathing stops for even few minutes. 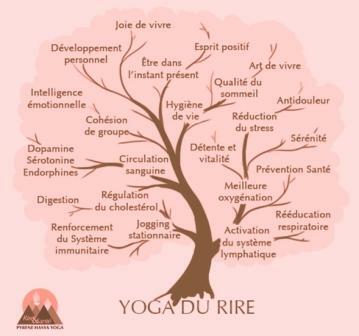 According to yogic philosophy, we are alive because the cosmic energy from the Universe flows into the body through the breath, which is the life energy force or Prana, as called in yoga. Due to stress and negative mental state, breathing becomes shallow and irregular. We tend to hold our breath whenever the mind is upset or in a state of turmoil. This leads to lack of oxygen and accumulation of carbon dioxide in the blood which further causes anxiety, stress arousal and emotional reactions. The hallmark of yoga breathing is that we should exhale longer than inhale so as to get rid of as much of the residual air from the lungs, and bring in fresh air and more oxygen for the next breathing cycle. Have you ever realized what are we doing while laughing? Actually, we are exhaling. During laughter, exhalation lasts much longer than in regular breathing. In normal breathing we inhale and exhale only 500 ml of air while there is 1500 ml of residual and stale air which has more carbon dioxide. This can be forced exhaled by laughter exercises which bring more oxygen to our body and brain. The principal organs of respiration are the lungs. Due to sedentary lifestyle we do not utilize the full capacity of our lungs. As a result, part of our lung cells does not participate in oxygen and carbon dioxide exchange. Laughter and deep breathing exercises open up all the cells of the lungs and also the respiratory passages. This leads to an increase in breathing capacity, also called vital capacity. It is important to know that diaphragm is a major muscle of respiration which separates the thoracic and abdominal cavity. Two thirds of breathing takes place by the movement of the diaphragm and only one third by the expansion of the rib cage. Under stressful situations, most people breathe from the chest and do not use their diaphragm. Both laughter and yogic breathing exercises are intended to stimulate the movement of the diaphragm and the abdominal muscles. The diaphragm is connected to a special branch of the autonomic nervous system called the parasympathetic system or the calming branch responsible for relaxation. The opposite is the sympathetic system, also known as the stress arousal system. One can turn off the stress arousal system simply by learning to move the diaphragm. The most important exercise done in laughter clubs is the chanting of ho ho ha ha ha, which helps people to focus on abdominal muscles so that they can learn to train their diaphragm and laugh from the belly. There is a direct relation between the breathing pattern and the state of mind. When under stress breathing becomes fast, irregular and shallow. There are spells of breath-holding according to the number of disturbing and negative thoughts crossing the mind. In contrast when the mind is at peace, breathing becomes more slow, regular and deep. Breathing is the only process that has a dual character. It goes on automatically and is under the control of the unconscious mind, but it can also be consciously regulated or changed. Through the practice of belly laughter and deep breathing, we can learn to change our breathing pattern from shallow to deep and easily alter the thoughts in the mind. Even if one has disturbing thoughts, with deep breathing, the body will not experience stress response. Unconditional laughter connects people from different cultures, countries, no matter what language they speak or how they live. Laughter Yoga promotes a strong union between those who laugh together resulting in family-like bonds, providing social interaction and networking --- essential for happiness. The goal of Laughter Yoga is to connect people with one another at heart level without judgment --- this is the true meaning of yoga. Laughter Yoga goes beyond just laughing. It not only fosters a feeling of physical well being, it enhances the spirit and touches the emotional core. It has the power to change the selfish state of mind to an altruistic state of mind. It has been proven that people who laugh are likely to be more generous and have more empathy than those who don’t laugh. This inner spirit of laughter becomes apparent as people develop a state of internal peace. The worries and intense goals that have driven their lives become less important. People become aware that true happiness comes from giving unconditional love, caring for others, and sharing with each other. 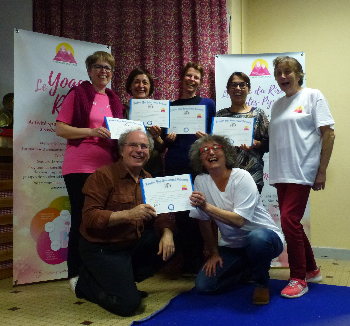 Laughter Yoga inspires members to make the world a better place not only for themselves, but for everyone. According to the yogic philosophy the food we eat should be digested properly and the nutrients must be well circulated in the body and finally be metabolized to produce energy. For doing all this, the most important component is oxygen. Therefore, the digestive, circulatory and the respiratory systems should all be equally efficient so as to maintain optimum health. Let us examine how Laughter Yoga contributes to strengthen the digestive, circulatory and respiratory systems. All the principal organs of digestion like the stomach, intestines, liver and pancreas are situated in the abdominal cavity and are supported by strong core muscles on all sides. The movement of the abdominal muscles and the diaphragm during normal respiration naturally provides a gentle massage to these organs. In Laughter Yoga we have different styles of belly laughter that exercise the abdominal muscles and the diaphragm simultaneously. Scientists have referred to laughter as ‘internal jogging’ that goes right inside the belly and readjusts the internal organs. Regular laughter exercise not only strengthens the abdominal muscles and gives an internal massage, but also holds the abdominal organs in their proper places. This ensures proper digestion and absorption. All the body’s nourishment is absorbed into the blood. It is processed in the liver, passed on to the central pumping system of the heart, and pushed throughout the body through a network of blood vessels. Similarly, the blood, after supplying the nutrients, collects the wastes of metabolism and returns to the heart and lungs for purification. The most important organ of circulation is the heart. Laughing promotes a healthy heart. A constant change in intra-thoracic pressure while laughing and breathing helps to draw in venous blood, returning from all the major vena cavas of the upper and lower body. In a good bout of laughter, there is dilation of blood vessels all over the body. We’ve all seen or experienced this as a flushed appearance and feeling of warmth. Pulse rate and blood pressure rise as the circulatory system is stimulated before settling down, below the original levels. In a nutshell, laughter helps tone the circulatory system of the body. Once all the nutrients are carried to the tissues, they need oxygen to metabolize. Laughter and breathing exercises help to increase the breathing capacity of the lungs and increase the net supply of oxygen to the body.